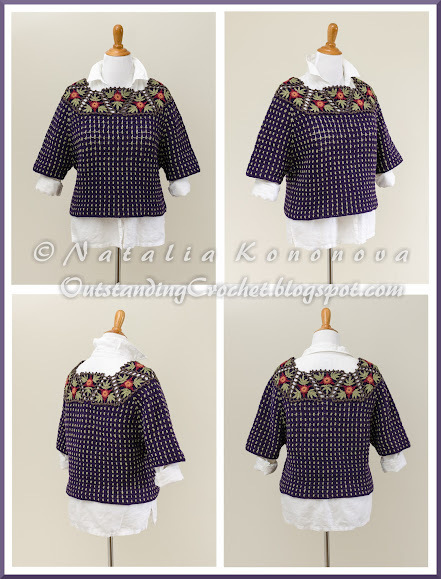 Outstanding Crochet: My new project - Crochet Pullover "Mediterranean Night". My new project - Crochet Pullover "Mediterranean Night". As I promised to myself not to post any pictures of new projects until the pattern is done, I kept this promise this time. The pattern is ready, though I am thinking to add motifs step-by-step pictures for the people who are not confident in intermediate level and want to go level up. Little bird told me I might get my work permit in 3 months. I also want to tell a few words of how this project started and went on. First, I figures out triangle motifs with flowers. Played for a long time to make a neck band of a shape I liked. It takes some pencil-architect ruler-eraser-protractor-compass work at this point. Then I made a body out of brown thread. When it was nearly finished, it was too ordinary and I didn't like it. I started to play with other colors I had and found out that purple goes so well with the rest. I also re-did the neck band to a different shape. I had that block-stitch in the back of my mind for a while thinking to use it some day. Well, it was perfect for this project. All that took a long time, mostly thinking and changing the whole idea, crocheting is fast. The only tricky part, that of course, though I make a sample first, measure it and figure out how many stitches I need to meet my prototype size, however, when I start with some 200 stitches and only when I make about 4''/10 cm, only then I see the true gauge! More ripping off on the way. This time I did writing instructions on paper while crocheting, and was so thankful to myself when putting them down in Open Office document on the computer. That's the best way to do that and I know that and still don't follow every time! 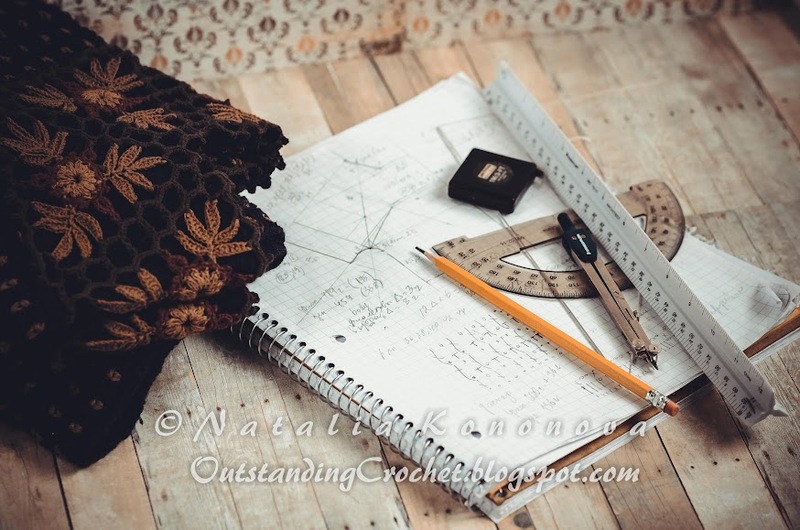 I have a template document with some essential parts included - level, size, copyright information, materials and tools, abbreviations, stitches glossary table and so on I use for every file to begin with. 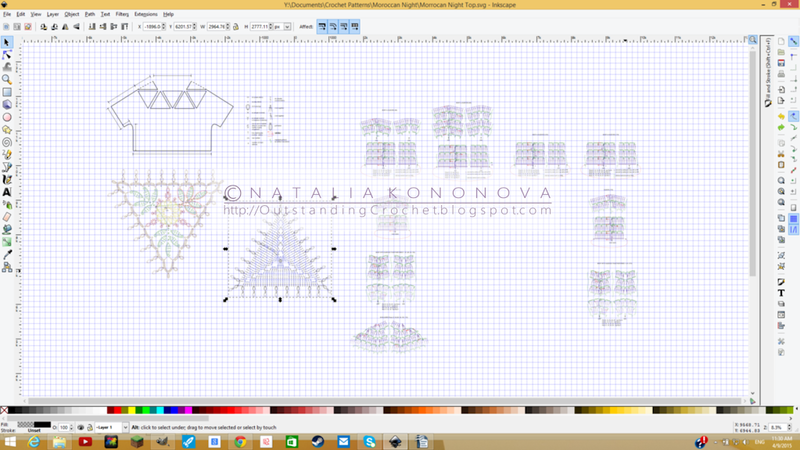 I make charts all through the process, some of them in the beginning, some of them at the end, in sizing step. Sizing... I don't even want to talk about it, the worst part to work on for me. :))) The image is blurred on purpose. Anyway, the pullover is ready and I love it. The pattern is made for sizes 35 (37-3/4, 41-1/2, 43-1/2''/89 (96, 103, 110) cm bust circumference, though the pullover has a loose shape, so sizing is not very strict to follow. You know only when I saw the designing process from inside, I understood how much effort is put in that work! Not just crocheting, that's the easiest part for me, but creating to make it stand out, changing, re-doing, starting from the beginning sometimes. My big respect to all designers out there. I loved these triangles when you first showed them to us. Now they're incorporated into this wonderful garment, I love them even more :-) Three more months when you've waited so long already for this work permit, have you tried talking to your congress representative to see if anything can be done to hurry it along? Thank you, Sue! Congress representative? I am nobody for this country until I get my Green Card. Even then I can't vote. Emigration reform is not an easy subject. There is nothing to be done at this point, just waiting and praying to the Universe. Beautiful work!! I hope your work permit comes through quickly without much more waiting. Natalia, this is truly OUTSTANDING CROCHET! Let me know if you need any pattern testers when your visa comes through! I would both love to crochet some of your designs, as well as help you perfect your patterns for the market. Thank you! I will keep it in mind! Beautiful pattern Natalia! Gorgeous . Great to see your positive outlook - it will bring you everything you need in life! Also - an amazing way to document and store your patterns - I'm very impressed! Gorgeous pattern! Let me know when I can purchase, I love your work!!! Наташа,прими и мой комплемент...ОЧЕНЬ ИНТЕРЕСНОЕ РЕШЕНИЕ с треугольными мотивами. Давно слежу за твоими проектами,многое очень оригинально и красиво.Молодец! I love your work. I was wondering if you're going to post the pattern of this piece for sale on Ravelry. Thanks! Thank you! Yes, I will. I'll let you know when I do. Your crochet is just something else! I really love your work and this pullover has really caught my eye! It is gorgeous and unusual! Just wonderful! If you ever consider selling the pattern, could you please let me know? I would love to purchase it! Please keep dazzling me and many other people, I'm totally sure, with your wonderful masterpieces! Sofia, good news! I submitted this pattern for testing today. So you can get it for free, but you will have to test it. :)))) Or you can wait when we are done. My deadline is December 15. That's wonderful news, Natalia! :D I think I'm going to wait until you're done! ;) Many thanks and best regards! Natalia, when will the pattern for this beautiful work of art be ready for purchase? I really must make and wear this garment :) It is stunning!! Becky, you are just on time! I submitted this pattern for testing today. So you can get it for free, only downside, you will have to test it. :)))) Or you can wait when we are done. My deadline is December 15.
:)) Good luck with everything! That's wonderful news Natalia! Thank you very much!